At the end of PST volunteers have to take a Language Proficiency Interview (LPI – if you haven’t noticed already Peace Corps uses A TON of acronyms) to evaluate their language skills after intensive training. Language training is a main component of PST and, in my opinion, it is imperative to learn the language in order to successfully integrate into the community. During PST we had language class for about 4-6 hours for 5 days a week in our satellite sites. Our training in Pajove with our small group was primarily language, mixed with some culture and technical training as well. We had classes focusing only on language on Mondays, Wednesdays, Thursdays, and Saturdays. Then we had HUB training on Tuesdays and Fridays, which consisted of some language training and everything else as whole group. Language training in Peace Corps can be extremely frustrating, but after it all I feel ready to have basic conversations about the Peace Corps and myself with members of the community. Two Albanian women would switch off teaching the Pajove group and the Bisqem group. I owe my language skills to these two. They helped me so much along the way with learning the language, as well as the culture. After PST, I am proud to consider both of them my friends. I will definitely miss seeing them as much during my service, but I plan to visit them when I am in Elbasan. During PST I became very proactive with my language learning, since learning in the classroom was not always working for me. I wanted to do well on the LPI and shqip is an extremely hard language to learn, especially for me since I do not have another language under my belt. I will speak more about shqip specifics in a blog to come. I would speak with my teachers everyday after class for extra tutoring to help me with my pronunciation and speaking skills. I had pretty bad pronunciation at first, but now it is a lot better. For the LPI, volunteers were given a list of 77 questions to help them study for the interview. The questions were regarding topics of introducing yourself, peace corps, family – in the states and Albania, friends, daily routine, free time, food, traveling, weather, and clothing. Following the LPI, volunteers are rated through the American Council of Teaching of Foreign Language. There are 4 levels that volunteers receive after the 10 weeks of language classes. Those levels are novice high, intermediate low, intermediate mid, and intermediate high. I didn’t think my interview went very well, but I ended up scoring intermediate mid. Scoring intermediate mid means that, I can participate in shqip about some survival needs and social traditions. I can discuss topics beyond basic survival, such as personal history and leisure time activities. I am beginning to use correct basic grammar constructions such as subject-verb and noun-adjective agreement. I can handle questions about my marital status, nationality, occupation, age and place of birth. I can order a simple meal from a restaurant menu. I can ask for or tell the time, date, and day of the week. I can handle simple business at the post office, a bank, and the drugstore. I’m beginning to speak more correctly; my subjects and verbs generally agree. I can perform at least one task at the intermediate high level. After the interview I was extremely upset because I felt like I didn’t do well, but I am now very happy with my score. Most of the group scored at the intermediate low and intermediate mid level, with 7 volunteers scoring intermediate high. I am not sure how accurate the test is at evaluating our level because the intermediate mid group consisted of speakers at many different levels, but it was still a good indicator for how much I am comfortable speaking about. I look forward to continuing my language learning at site with a tutor that I will have to find on my own in the community. My host sister is engaged…?! So my 18 year-old host sister just got engaged. I can’t deny that when I received this news I was extremely surprised and a little disappointed. The day that I returned to my host family after my site-visit my host-mom informed me that the four days I was gone in Kavaje my host sister got engaged. At first I was very confused because I had never heard my sister even talk about boys before and I was under the impression that she wanted to continue her schooling after high school. After asking several times I think I finally got a handle on how she met her new fiancé. It seems as though my host-sister’s fiancé was having coffee at the local near the school when he noticed her in the schoolyard. He is no longer in school, considering he is 25 and works in Italy part time. I still haven’t really been able to figure out many details about him or his family and I think part of the reason why is because my host family doesn’t really know much about him either. The language barrier has made this whole situation very confusing, but as long as my host sister is happy then I am happy as well. The day after I arrived back from my site-visit was my host-sister’s engagement party held the girl’s half of the family. There was a second engagement party hosted by her fiancé’s family later that week. Things happen extremely fast here in the villages from what I have observed – it is very traditional. The engagement party was super decadent and extremely fun! I had a great time and luckily I was able to invite two of my close friends to the party as well. Susan and Paul came to the party with me. They are both extremely educated doctors from Grand Junction – Colorado people really are awesome! The party started with my sister’s fiancé’s family coming over to our house for caramels, nuts, and raki for the men. Raki is an alcoholic drink that is extremely popular in Albania, mostly for men. It is extremely rare to see a woman in Albania drinking raki, at least in the villages. The men of the family went and chatted in the nice living room, while most of the women (including me and my friends) sat around in the kitchen. After two hours, the party moved over to a locale that my cousins own. This is when the real party began. At the local we had a DJ, a camera-man who filmed the whole ordeal, and tons of circle dancing and food – specifically tons and tons of meat. Circle dancing is a dance that is the main dance at festivities in Albania. I am still not very good at it, but avash avash. After a few more parties I am sure I will be pro. If you are interested in what circle dancing looks like you should check out youtube and try to find some videos of weddings and circle dancing in Albania. The music at the party was extremely loud, so circle dancing was the main attraction throughout the party because having conversations was not really possible for a lot of the day. My host sister and her fiancé pretty much danced every single dance, I am not sure how they ate any food at there party. My family even had me lead one of the circle dances, which was an interesting experience considering that I can barely even do the dance, but it was still fun! Now to the food at this party, it was extremely decadent. The first plate of food consisted of at least five different kinds of meat, which I ate because honestly I rarely ever get any protein in my diet, so it was worth it. 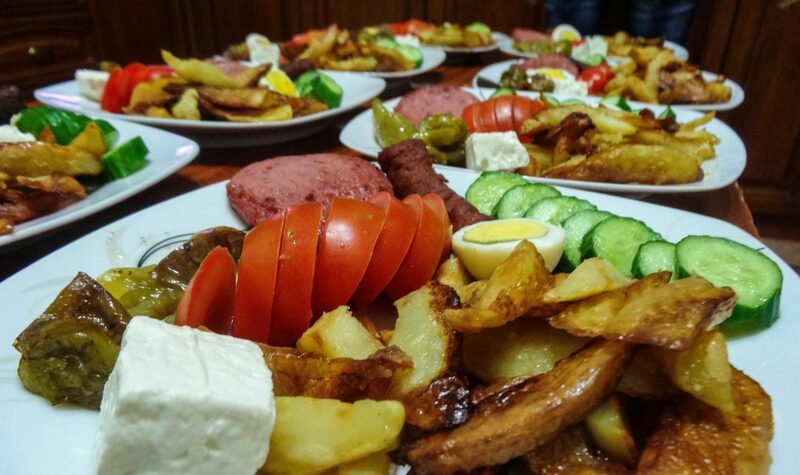 There was also salad, kos – an Albanian yogurt, bread, and tons of other dishes on the table as well. Besides the food there was also a ridiculous amount of beer and raki (but raki only for the males). It is culturally appropriate for women to have a beer or two at special occasions, so I decided it was okay to have a couple beers. Every time I finished a beer the waiter brought me a new one – it was so crazy! And every time I thought the meal was over more and more delicious meat was brought out for everyone. It was really quite the party! All within a week my sister got engaged, has her engagement party, and moved out of our house. Yes, my sister has moved out. It surprised me too. After the engagement party my sister slept at our house for a day or two, but then she was gone. Now she lives with her fiancé and his family. It is Albanian tradition. Once my sister moved out of the house the dynamics of my family definitely changed. My sister was the only one who spoke any English, even though her English was limited it was still nice to have her help translate if I was confused about a conversation. Luckily, now I have enough shqip to feel comfortable without an English speaker in the home. Even though it is Albanian tradition for the female to move out of the home into the fiancé’s family’s house, my family was still pretty upset and worried. I watched every member in my family cry at different times throughout the last couple weeks because of the engagement. It was extremely hard for them to lose their only daughter and they were not happy that she got engaged at such a young age. I am under the impression that my host-mom and dad wanted her to go on to university and make a different life for herself. My host-mom and dad were an arranged marriage, and even though my sister’s engagement wasn’t arranged it went very quickly and they barely knew each other, so this worried everyone in my family. I am not quite sure what will come out of this whole situation, but as long as my family is happy then I am happy. These traditions are just so different from anything that I have ever experienced before, so I am still not sure how to react to everything. But I wished everyone good luck and listened to all my families worries regarding the situation. This past week I finally had the opportunity to go and visit the city where I will be living for the next two years! And I am officially super excited!! Kavaje is such an awesome city, definitely a lot bigger than Pajove. From what I have observed thus far I think my life in the city will be very different than what I have experienced living in the village thus far. Along with seeing the city I also got to see the apartment that I will be living in… and it is GREAT!! I am so excited to finally move in and I have already decorated the place up a little bit. The apartment comes fully finished, which is super nice and my landlord has provided me with everything that I need, including dishes, blankets etc. It is so awesome. It looks a little bit like a retirement community apartment, but I think that adds a nice little flair to my whole arrangement. The only downfall to my apartment is that I have a Turkish toilet, which for those of you who don’t know, that is basically a hole in the ground. I flush my toilet by filling up a bucket of water haha. It actually isn’t that bad and I will have thighs of steel by the end of this whole endeavor, so ska problem. My landlord did mention that he would install a western style toilet if I decide to stay longer than 6 months or a year, but I don’t really care that much. Like I mentioned, it will basically just be an extra workout for me! The first night in Kavaje I went out for coffee and dinner with my sitemate Kate and her counterpart. Kate is another volunteer from my group that will be teaching English at one of the local high schools in Kavaje. Her counterpart has a car, so she drove us to the beach and we had pizza and watched the sunset. It was absolutely gorgeous. Sometimes things here are so utterly beautiful (and more westernized – considering I am not living in a mud hut) that I can’t believe this is actually Peace Corps. But just because I am not living in some hut in the middle of no where doesn’t mean that I don’t experience the same challenges and emotions that other volunteers around the world face. It is just different and Peace Corps always stresses that, even during the extensive application process. I am very happy to have Kate as my site-mate because she is a very nice person and I think that we will get along very well! I think we will definitely try to collaborate on several projects together while we are living in Kavaje. I am very interested in helping her out with projects and I think she is also interested in getting involved in some of my sector projects. Having Kate in Kavaje will really be nice because we are friends. As many of you know I was not much of a cook in the states, but I am really hoping that my extra free time here in Albania will allow me to cultivate these important shtepiake (house-wife) skills. My site-mate and I made some eggplant, pilaf, and salad in my apartment while on our site-visit. And when I say my site-mate and I, I really just mean that my site-mate made me dinner while I watched haha. Soon though I will know how to make bureke and other Albanian speciality dishes!! And hopefully some good American dishes too. My final day in Kavaje was spent at the office working off the health calendar. The ministry of health puts out annual health calendars that all of the D.Sh.P’s in Albania are supposed to follow. On Friday it was the “day of hypertension.” My office’s day of hypertension consisted of a small table in front of the health center with about 15-20 pamphlets about hypertension and then one lady in my office was taking blood pressure. This kind of activity is very normal in Albanian society and one of my duties as a pcv (peace corps volunteer) here is to give the citizens different more-sustainable ideas for projects and activities. I want to begin moving outside the box with my office and developing other activities outside the normal span of handing out pamphlets. These past two days have been super busy. Yesterday, our training group went and toured Tirana – the capital city of Albania. Our ride to Tirana was extremely interesting because all of us volunteers took a big nice bus up this sketchy narrow road over the mountain from Elbasan to Tirana. Let’s just say some of us weren’t feeling that great after the experience. During the tour we went to the Peace Corps office, different furgon stations, and other areas around the city. However, most of us still probably have no idea how to navigate the city. It is a big place and the furgon stations to take you to all different parts of the country are located in different areas of the city depending on where you need to travel. If I want to go visit volunteers in the north of Albania I will have to first travel through Tirana to meet them. In most cases I think volunteers will meet in Tirana and help each other travel to their sites. The Peace Corps office is located there and trainings after PST are held in Tirana. My tour guide was pretty good though and it had helped that I traveled through Tirana previously for my volunteer visit. We were shown all around town and for lunch we ate cheeseburgers and American food – it was a nice change from all the bread and pilaf that I have been downing in the village. I also just had to mention that there is a club in Tirana called the “Harlem Shake” because I think a lot of you back home will appreciate that. I can’t believe that a trap artist from back in the states made it big enough to have a club named after it in Albania haha. After the tour we headed to Durres for our counterpart conference. This was a conference to meet the people that we will be working with for the next two years. My counterpart, Ela, is a really beautiful younger woman who has two children. She speaks wonderful English, which is definitely helpful for this whole transition period, and she seems motivated to get work done. Ela lives in Tirana and commutes to Kavaje everyday via bus. Ela is one of four counterparts that I will have a the Directory of Public Health (D.Sh.P). Two of my counterparts speak English and two only speak Shqip. Even though I can communicate with several of my counterparts with English learning Shqip is still extremely important to me. Overall I really enjoyed the conference and it was located at this beautiful hotel right on the beach, but it was a bit much to have the tour and the conference in the same day. A lot of us were tired from all the travel and moving around for the day, so it was hard to be extremely focused when meeting our counterparts for the first time. But we at least have two years to work with and get to know these people, so avash avash. At the conference we talked about different projects and activities that we can work on this summer. My counterpart and I still haven’t set anything in stone and I see this summer as being a bit more relaxed. My office in the Directory of Public Health follows the Health calendar schedule that it put out by the Albanian government. During the summer there aren’t many activities going on with the calendar, but I can discuss this in more detail in blogs to come. Gotta embrace the chaos, and along with the chaos you gotta embrace the inevitable language barrier. I can’t even begin to imagine some of the random things that I have said to my host family and other Albanians that makes absolutely no sense whatsoever. And anyone who knows me, knows that I have an extremely loud boisterous laugh… which also leads to many awkward situations here in Shiperia. I tend to laugh all the time, whether it is appropriate or not. Many Albanians seem to love my laugh, but some seem somewhat confused as to why I am constantly laughing. But in the midst of the past month and a half here I have had several hilarious miscommunications that are noteworthy for this blog of mine. The first, and probably one of the funniest, miscommunications was when my family thought that I think milk comes from a chicken. I was trying to discuss how I am a vegetarian, so I don’t eat chicken or meat. Then I continued to talk about how I don’t drink milk or eat a lot of dairy here because I think I may be lactose intolerant. Somewhere along the conversation I mis-communicated that milk indeed does come from a chicken and not a cow. How I did this, I do not know. But my family definitely thought I was a little crazy and obviously not from a farm. Those Americans are just so far away from food production in the states that they don’t even realize the simple truth that milk comes from a cow and not from a chicken. I eat a lot of bread here. Period. Shume buke constantly. Bread for breakfast, lunch, and dinner. My diet is almost the exact opposite of what it was in the states, which, in turn, is making me fat. I don’t really have too much of a choice over my diet while I am living with a host family though, so I guess I just gotta embrace the carbs. I often have conversations with my family regarding how I am getting fat and how much weight I have gained since moving to Albania. I am not sure that they get the hint though that I don’t want to get fat, but it’s all good. I am getting a true cultural experience. One night when I was telling my family that I am getting fat they kept telling me no you’re skinny. I didn’t quite understand what they were saying, so my host sister pointed out the word dobesim in the dictionary. The definition for dobesim is “wasting away, losing of flesh, weakening, growing weaker, failing.” You can imagine my how confused I was upon reading this definition, but I thought it was absolutely hilarious. I started laughing so hard that I was on the floor laughing and crying. It was great. It turns out that they were just trying to tell me that I am skinny and that I shouldn’t worry about my weight. They really are great people. Luckily, I can laugh these things off, but really these moments are what makes PST and Peace Corps Albania so awesome. Getting lost in translation can be very frustrating, but most of the time I just laugh and smile and Albanians seem to enjoy that. Even though I may not understand them, at least my laugh amuses them. I can only imagine what other weird things that I have communicated to people along the way, but hey – whatever! If I had 100 leke for every time I laughed at an inappropriate situation here I would be rich. Avash avash! I had a really nice weekend, way more relaxing than some of the previous because I didn’t have to travel to Elbasan for school. I found out that the ice cream shop in Pajove has wifi!! I wish I would have figured this out before PST was half-way over, but it is nice to know that it is there. I will probably go there after class to study and get on the internet. Then on Saturday, I had language class in the morning and then had the whole afternoon off. Some of the girls decided to have another movie day, while the boys went and played Frisbee. It was fun to relax with everyone. After the movie was done we all met up and hung out for a while. A couple of us decided to explore parts of the town we had never seen before, so that was an adventure. We ended up walking into a nice coffee shop in town, that we had no idea existed. A girl our age was working at the café and she spoke English, so we invited her to join us for coffee. She told us about how she grew up in the village, but now she lives in the capital – Tirana. She is studying French, but also knows English as well, and she works as a translator there. She discussed with us the differences between life in the capital and life in the villages. It was very nice to have a conversation with a progressive Albanian female. I got some of her contact information and hope to meet up with her if I am ever in Tirana or if she comes back to Pajove before I move. It is nice to make Shiptare friends!! Amber and I decided to have a “Jill and Amber day” on Sunday. We both needed to buy some more professional clothes, along with some summer clothes. I cannot stress enough how hot is it going to be this summer. I am very interested to see how it will be, since it is already super hot. It is funny to think that back in Colorado it has been cold and snowing, while here it is just extremely hot and humid (at least humid in comparison to Colorado). Since we both had the urge to shop we decided to hit up Elbasan to go to the Gabi, which I have mentioned in earlier blogs. The gabi is a giant outdoor second-hand area where one can haggle for the best deal. We both bought some cute clothes and got some good deals. Neither of us paid more than 200 leke ($2) for any of our clothing items. And we were probably charged more for being American, but it is still worth it in my mind! It is hard to find anything that cheap back in the states anymore. Besides buying some new clothes I made a big change today and chopped off my locks. Amber wanted to get a trim, so we asked one of our amazing language teachers to help us and she took us to her hairdresser. My haircut was only 600 leke (or $6), so it pretty expensive for Albanian standards, but super cheap in comparison to what I spend on my hair in America. I now have a short pixie cut… and it looks awesome!! We will hafta see if I can style it quite as good as it looks now, but I will probably need to buy a hair straighter or a blow dryer, since I didn’t bring either of those things from the states. It feels really good to finally get rid of all the damaged hair and it really is liberating to finally be rid of all the drama that my hair has caused over the years. And who knows, now I may even be able to grow my hair out past my shoulders. I just figured that if I was able to move halfway across the world, that I should make another drastic change. I have a new life and a new haircut to represent the new me! Plus, it is just too hot and humid to deal with my frizzy curly hair all summer. PS: on another note my host brother filled out my glass for me today at dinner! And my host dad helped put some of the dishes on the counter to be washed! It was nice to see them do some of that stuff instead of the other way around. And today one of my host brothers, who normally doesn’t do much work, was helping the family plant vegetables out front! I always joke with the family and my brother about how he doesn’t work and I see him sleeping at the car wash (my host-fathers business where he works), so it was cool to see him pulling a little bit more weight on that end of things too. Avash avash!